I am still in the Christmas Rush. I would like to send out a tatted piece with each Christmas card I send this year. That is ALLOT of tatting. 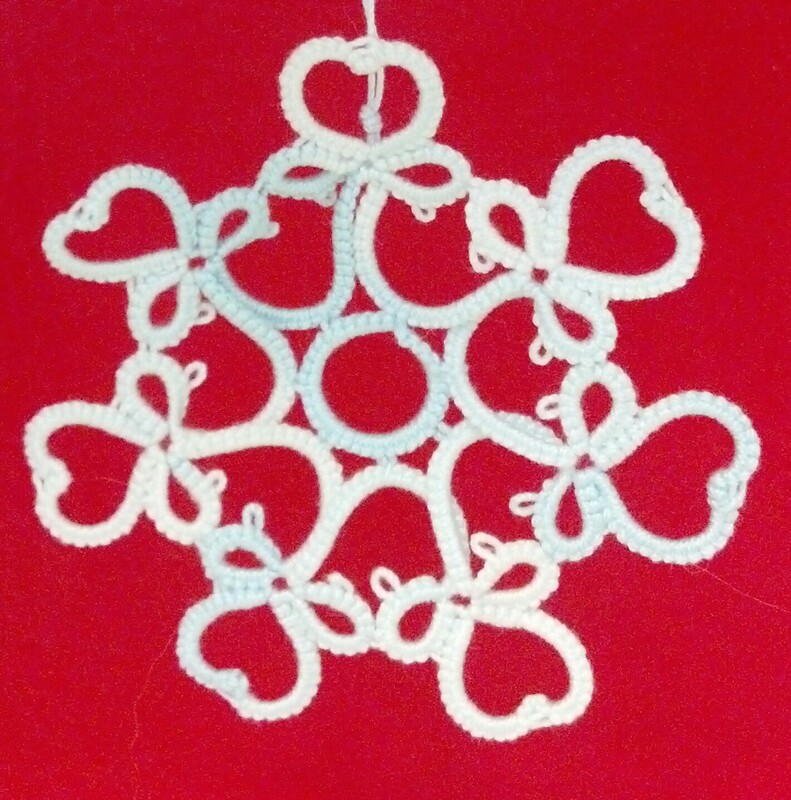 I decided to go with a pattern from “Tatting With Visual Patterns” by Mary Konoir. I included a picture down below. In her book, she calls this pattern “Posy” and it does not included the beaded accents. I started replacing picots with different beads and different counts to get different results. That is how I came up with this weeks challenge. This is a two part challenge. 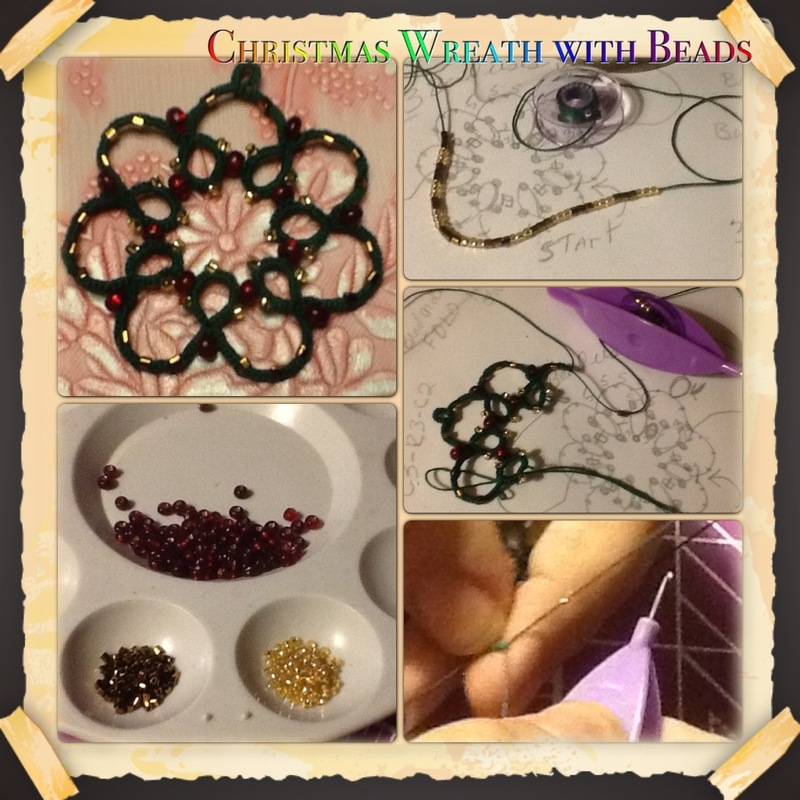 Part one, make the wreath I designed to show how bead placement works. Part two, add beads to a boring old motif to make it Fabulous! There are 3 basic bead uses in tatting (least that I know about) Bead either sits on the tatting, in the tatting, or is placed on the picot as it is being joined, placing the bead between the tatting. 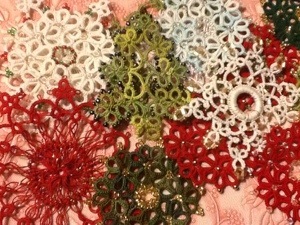 I made the following wreath motif to include each method. Hopefully, by the time your done, you will feel more confident then when you started. 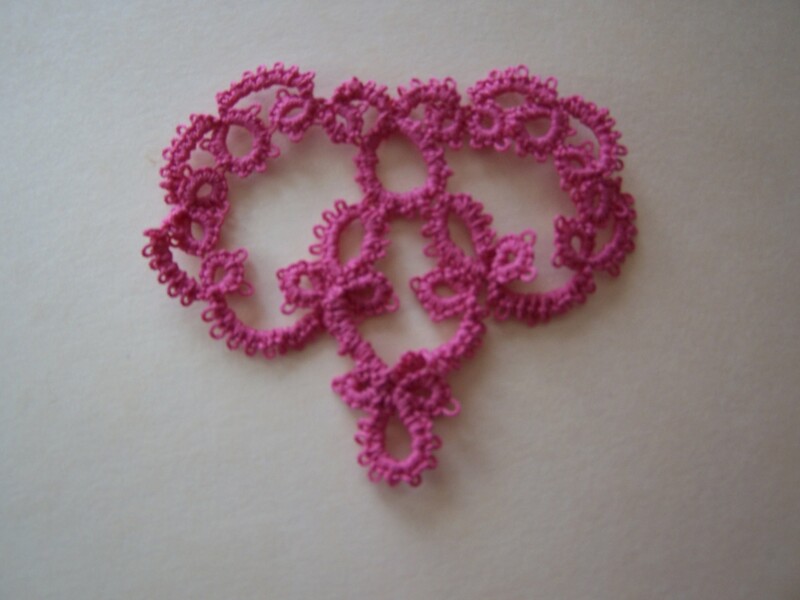 To make the bead sit on top of the tatting, the beads must be on the thread around your last hand. When stringing beads, this means the beads need to be strung based on where they are being used. If they are being used on a chain, they need to be strung on the ball thread. If they are being used on a ring, they need to be strung on the shuttle thread. When making a ring, slide the proper amount of beads down the thread so they are included on the thread around the hand. When needed, just slide the proper bead count into place and treat as a picot. I used this with the light gold beads on the rings in the pattern. 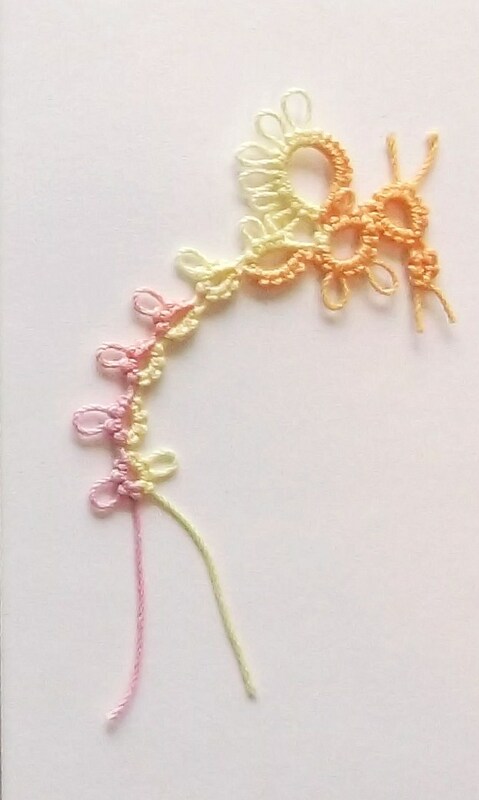 To make the beads sit inline with the tatting, the beads need to be placed on the shuttle thread until slid into place. Keep the beads wound on the shuttle till needed, slide down bead, the DS on the other side. I used this technique on the putter chains of this pattern. This method can make chains longer and rings bigger so you might have to lower stitch counts if you use it extensively. Finally, the easiest way to add beads to a piece is to add them to picots, because since they are added as you go, they don’t need to be prestrung. Picots must be at least twice as long as the bead is tall so a join can be made. Depending on th size of the bead, a size 12 or 14 crochet hook is needed. Note: adding a bead to a picot will add a definite space between the tatting being joined so can cause very obvious changes in how a pattern looks when finished. Now that you have decided how you want to use the beads, you need to decide on the order to string them on the thread. All beads strung need to be strung in the opposite order of use. The first bead on is the last bead off. To through your pattern and write down the beads in the order of use then simple string them backwards. For this pattern, you want to string the beads for the chains first, the the rings. The pattern is CCCBBB x7. You will end up with 42 beads, all on the shuttle thread. I used size 11 beads for B & C, and E-beads for the JBs. Now lets start the pattern. Each ring starts with 3 beads on the thread around the left hand. Cut, tie, and hide your ends. 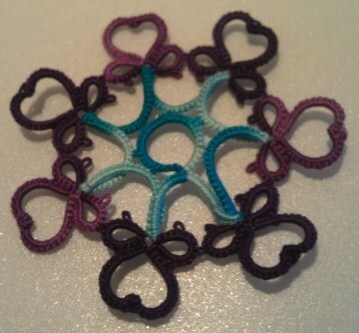 Hope you enjoy adding beads to your next tatting pattern. They not only add sparkle, they are a great way to make a popular pattern yours. Happy November 15th! Today marks the beginning of the Christmas Advent for many Orthodox religions. For me, it is the day I start preparing in earnest for the upcoming holiday season. As you can see from the picture, I have been working away on items to include in this years Christmas cards that I am determined to get in the mail by the first. While tatting all these wreaths, I started thinking about something we could do to celebrate our first holiday season at the Shuttlebirds Blog. To me, nothing says Christmas like a GIVEAWAY!!!! You heard right, it is Giveaway time here in Shuttlebirds land. As I look around the workroom, I see all sorts of goodies I can put together to make any tatters holidays shine brighter. I have tatting bags, shuttles, scissor cases, glass handled crochet hooks, thread, beads, lion, tigers, and bears oh my! I love to see my creations find warm loving homes to live out their useful lives. Now of course, all good giveaways have an entry fee. There is just no way around it. So what should it be? What should it be? and then it hits me, what I want most of all is to see your tatting. I want to go to my mailbox and see your cards, your small motifs, your art. That is my Christmas wish. To play with your pretties. So now, if your still following along, we have the giving part taken care of and the receiving part taken care of, now how about the goodwill towards our fellow man? If this succeeds, come January 1, 2014 I will have a nice collection of tatting to share with the guild. Once we have admire each piece, it will be loving put away until our Annual workshop. Come April, they will be put on display for all the attendees to admire with the tatters name and location. Then each piece will be auctioned off or raffled off, with all proceeds going into the Shuttlebirds Workshop Scholarship Fund that has been started to help offset workshop fees for tatters who want to attend but don’t have the means. Let me set out the facts. On behalf of the Shuttlebirds Tatting Blog, I am going to put together a prize basket to be sent to ONE lucky person who enters our first ever Shuttlebirds Blog Workshop Scholarship Fund Christmas Contest Bonanza! One entry will be given for each holiday card or tatted item received on or before January 2, 2014. Each Item received will be photographed and displayed on the Shuttlebirds Blog as received. Winner will be chosen January 4, 2014 at the Shuttlebirds Monthly Guild meeting and name will be posted on the Shuttlebirds Blog no later than midnight PST, January 5, 2014. 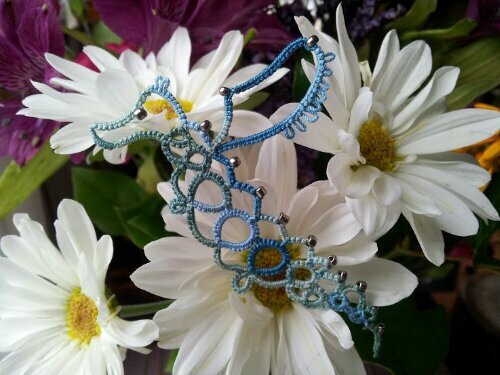 All items received become the sole property of the Shuttlebirds Tatting Guild and will be used as a fundraiser at their annual workshop with all proceeds to be put into the workshop Scholarship fund. Lets have some fun together! Celebrate and do some good for the new scholarship fund.